The Importance of Mario Odyssey’s Linear Primary Objectives – What's in a Game? While Mario Odyssey’s level design is open for players to choose what they want to do, the game wouldn’t be as impactful without its linear, primary objectives in each world. The moment you enter a world, the game gives the player a goal. The level is designed around guiding players towards the primary objectives without forcing them. Most players will complete the main objectives even though they aren’t required because they are so compelling. Most sandbox 3D platformers, such as Banjo-Kazooie, have challenges you can complete in any order, but none of them are “the primary” objectives. 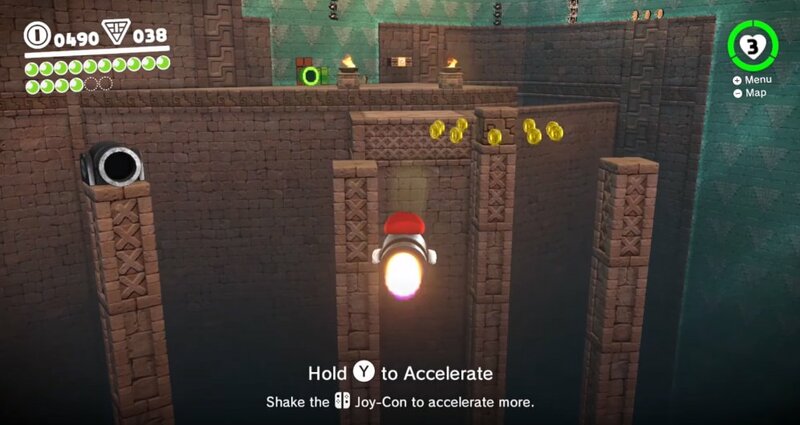 Mario Odyssey is the first 3D Mario to have a sandbox environment with unordered in-level challenges like Banjo-Kazooie (i.e., you can collect multiple moons without leaving the world). To deal with the concerns of this type of game design, Nintendo used strong primary objectives to create an experience that would be the best of both worlds for players that like sandbox worlds and those that like linear challenges. Game designers can use four-part structure, as perfected in Mario 3D World, to teach and develop mechanics, balancing difficulty within the linear challenges of the world. Players uncomfortable or overwhelmed in an open environment have challenges they can focus on to keep them engaged in the game. Every world can have cinematic, memorable moments that most players will experience because the level design is pointing them towards it increasing the feeling of epicness. A common theme in Mario games, especially 3D World, is teaching mechanics using a four-part structure – introduce, develop, twist, and bring the mechanic to a conclusion. Mario Odyssey uses 4 part structure heavily to make levels cohesive and understandable. 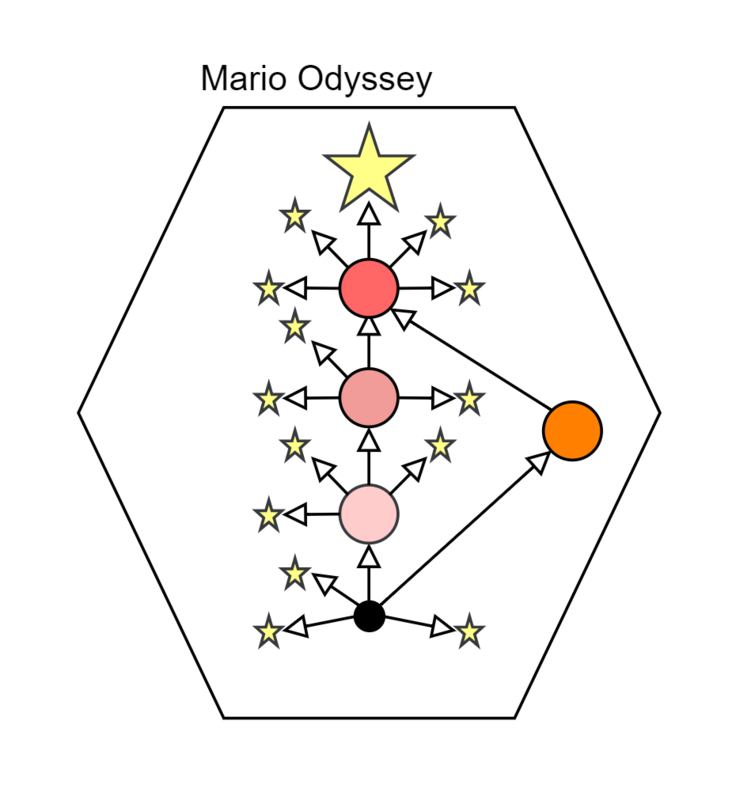 The four-part structure is the primary mechanism Mario Odyssey uses to keep low-skilled players in flow. Part 1 – Intro – Early in the level bullets come at you, teaching you what they do – fly around. 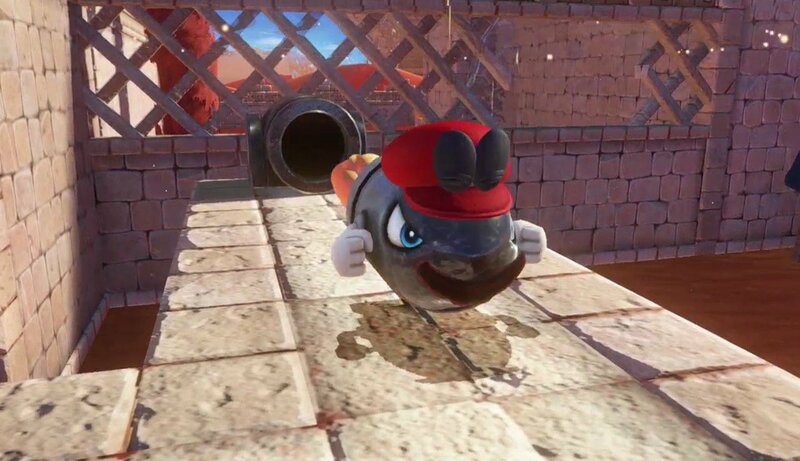 It’s not necessary to take control of any yet, but players will probably instinctively use Cappy to capture them by this point in the game. It’s an introduction to the flying-as-a-bullet mechanic in a reasonably safe, low-stress environment. Part 3 – Twist – The following room requires you to control a bullet, take it into another room, and fly through a few obstacles over a bottomless pit. This requires more complicated maneuvers with the flying mechanics and requires you to think more because there isn’t a bullet in the same room with the impossible gap. Along with the above, there are plenty of optional bullet challenges scattered along the way and off the beaten path, all that help you learn and reward you for using bullets in clever ways. Linear primary objectives give Nintendo a chance to teach most players mechanics before they reach optional challenges that use the mechanics. In traditional sandbox 3D platformers, it’s harder for game designers to naturally increase the difficulty of mechanics because players can complete challenges in any order. The game often uses multiple four-part challenges running in parallel to help levels feel larger while keeping the difficulty at the right level for the player and provide gameplay variation. For example, in between the bullet sections, you’ll find the game guides you through multiple four-part structures including invisible floors revealed by controlling Moe-eyes and sections where you have to learn to trigger and avoid shockwaves. The main path through the level acts as an obvious goal for players. Players uncomfortable in an open-world setting can stick to the main objective in the world and get most of the moons required to get to the next world, while high-skilled players can skip their way through the level or explore every nook and cranny. The obvious primary goals enable more players to play and have fun in Mario Odyssey. Most worlds have multiple primary objectives that you unlock in sequence. Each objective usually involves defeating a boss or reaching some location and rewards you with a multi-moon and tends to change the level in some way. Often each primary objective in a world opens up more non-linear sections of the world to explore, gradually increasing the exploration difficulty as the world goes on. Because primary objectives aren’t required to progress to the next world, if a world becomes too challenging for a player (either exploration challenge or platforming challenge), they can move on to the next world. The next world will tend to start with lower difficulty (the teaching part of four-part structure), different mechanics to learn, and more accessible exploration (at least until they progress through the world a bit). Additionally, moons in the current world are the only moons that contribute to progression to the next world, meaning players must spend some time in every world to at least learn the basic mechanics from that world. 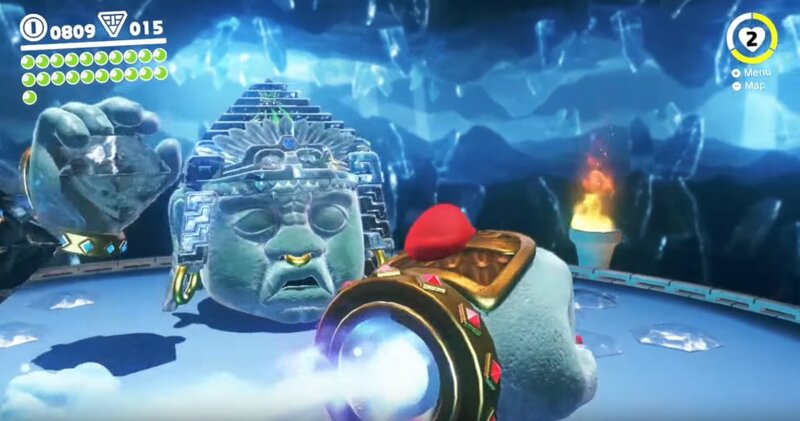 The main path and camera angles allow Odyssey to have a sense of cinematic epicness not seen in Mario since Galaxy 2. Purely unordered challenges would be harder to make epic in a 3D platformer. Why are primary objectives vital here? Road to Sky Garden: The goal is to reach the halfway point of Iron Road and defeat the Poison Piranha Plants found there. Flower Thieves of Sky Garden: The goal is to reach the top of Sky Garden Tower and defeat Spewart, one of the small bosses repeated throughout the game. Path to the Secret Flower Field: The goal is to reach the entrance of the Secret Flower Field and destroy the cannon found there. Defend the Secret Flower Field! : The goal is to defeat Torkdrift in the Secret Flower Field. This is a mega boss that requires using the mechanics learned in the level. Because the primary objectives are so compelling, most players will gravitate towards them so game developers know they can focus on the content. The extra focus that is put into the main path allows for more cinematic qualities to the experience. In purely non-linear environments you don’t know where players will spend their time, so it’s hard to know where to spend your development effort on. Some of your most epic content could be in a place that most players would never find! Mario Odyssey’s level design is a near-perfect blend of non-linear challenges with a compelling primary objective. Primary objectives are vital to the level design because they make it easy for the game designers to create epic experiences made for a wide variety of players.